Inspiring HANDS, Inc. is a non-profit 501(c)3, all volunteer, charitable organization whose mission is to directly make a positive difference in the lives of others in need. One of the ways we do so, is by providing annual scholarships to individuals of all ages who have financial and special needs. Awards offset tuition costs for them to attend non-profit summer camps and equestrian centers in Texas which focus on cultivating skills needed for success. This is accomplished through therapeutic supports and adaptive recreation which meet their unique special abilities. Our vision is to motivate partnerships within the community. We do this through promoting local volunteering, donation drives, scholarship sponsorship, and simply sharing information regarding needs within your community. 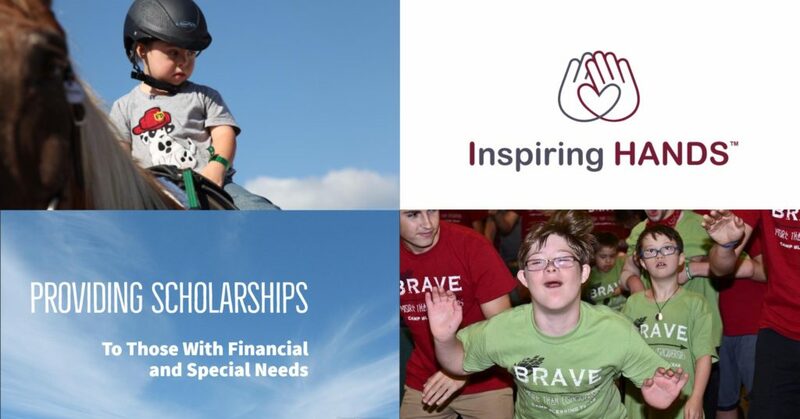 Each year Inspiring HANDS, Inc. provides up to $20,000.00 in Campership or Ridership Awards to qualified applicants who are approved by the selection committee. Awards offer children and adults with special abilities an opportunity that they otherwise may not be able to afford. Our scholarships help in building self confidence, independence, life skills, lasting memories, friendships, and so much more. Inspiring HANDS, Inc. serves individuals of all ages who reside in Harris, Montgomery, Liberty, Chambers, Galveston, Brazoria, Fort Bend, and Waller County, Texas who face financial and special needs. Our partners are non-profit camps and centers within the State of Texas. Inspiring HANDS is operated 100% by local volunteers allowing proceeds to directly support the scholarship program. CLICK HERE to learn more. The continued success of the scholarship program relies on the participation of those within the community. Without the support of our sponsors, donors and event attendees the scholarships would not be possible. Please join us each October for the annual Come Together Extravaganza which benefits the scholarship program. Inspiring HANDS welcomes anyone wishing to get involved as little or as much as you wish. To learn more, click the below links. It’s not just a donation. It is a life changer. When you donate to Inspiring HANDS, you join our cause and directly support individuals in your community. No matter the size of the donation, your support will make a difference in the lives of those with a financial need and special abilities right here at home.